Venue: Each month, KBF sets up State Challenges in provinces and states where five or more KBF Members are most likely to register and compete. States can be added upon request to the Tournament Director. For March, the states for which events have been set up are: South Carolina, Florida, Georgia, Tennessee, Alabama, Mississippi, Louisiana, Arkansas, Texas, Oklahoma, Arizona, California, Colorado, Delaware, Illinois, Kansas, Kentucky, Maryland, Missouri, New Mexico, North Carolina, Oregon, Virginia, Washington and West Virginia. KBF Rules are authoritative, taking precedence over all information presented in social media, TMS, oral presentations, and other information sources. Minimum Registration Threshold for this event to take place is five (5) KBF Members. Multiple Concurrent State Challenges: Competitors are not restricted to signing up to compete only in their state of residence but may sign up for and compete in as many concurrent KBF State Challenges as they wish, providing they have valid fishing licenses and/or comply with all regulations for each state in which they fish. Prize winners must be prepared to submit proof of regulatory compliance. Prior to the Registration Deadline, Entry Fee must be paid by PayPal account, debit or credit card. To register and pay the Entry Fee: (a.) log into TourneyX, (b.) navigate to the Event Page or click the dashboard’s “Register for Tourney” button and select the event from the drop-down menu, (c.) check a box that indicates agreement with and commitment to abide by all Rules, Competition Terms and Conditions, and terms of the Liability Release and Waiver Agreement, and then (d.) click the “REGISTER” button. Entry Fee includes a $5 TourneyX user fee and a $5 administrative fee that covers judging costs, event management, and the PayPal Transaction Fee of 2.9% plus 30¢. $10 goes to the KBF Challenge Championship prize pot, which is distributed as cash prizes in that October event. The remaining $15 of Entry Fee is distributed as cash prizes by rank. In each Challenge, $25-$50 is awarded as the Challenge Big Bass Prize. See the 2019 KBF Challenge Payout Chart for specific amounts. At the time shown below, a 2019 KBF Identifier Card with an Event ID Code will appear in Competitor’s TourneyX Dashboard. Print it for use in competition, or write the Event ID Code on a blank KBF Identifier Card. Each KBF Identifier Card has six boxes or “fields,” permitting one Card to serve for up to six concurrent events. Preprint a sheet of 8 blank 2019 KBF Identifier Cards by clicking this link: [KBF Identifier Forms PDF]. Using a permanent marker, write the Event ID Code in any field or box on the KBF Identifier Card. Digital photos for any KBF State Challenge may be submitted only for bass caught from public-access waters for which the competitor is legally authorized to fish, and for which he complies with all regulations. Competitors in multi-state or multi-province groups may submit bass caught in either/any of the combined states or provinces, providing they comply with all regulations (e.g., have a valid fishing license, meet boat permit requirements) for the water in which they fish. Bordering States’ Reciprocal Fishing License Agreements: On some state boundary waters, a reciprocal licensing agreement between the bordering states allows anglers with valid fishing licenses issued by one state to legally fish specific waters through which the border passes and sometimes in water well within the neighboring state’s borders. A competitor catching a bass in water covered by such an agreement may submit the same photo of that bass in both State Challenges, assuming he registered for both. For example, the boundary between Louisiana and Texas runs down through Toledo Bend Reservoir. Those two states’ reciprocal license agreement permits Texas and Louisiana residents with a valid fishing license issued by either state to fish from a boat anywhere on Toledo Bend. Therefore, a Competitor fishing the Louisiana KBF State Challenge may submit photos of bass caught in Texas areas of the lake and vice versa. The same photo may also be eligible for submission to other concurrent KBF Regional Challenges and Tournaments, if permitted by the rules for those other events. Be sure to read reciprocal agreement regulations carefully; they vary state-to-state. Some pertain only to residents, while others to all license holders, both residents and non-residents. Captains Meeting: View pre-recorded information in a Virtual Captains Meeting on YouTube. • 7:00 p.m.: Event ID Code Released; displays on TourneyX dashboard (browser) and KBF Website. Scores and Ranking: Event ranking is determined by the total score (length, adjusted by penalties for infractions, if applicable) for up to five photos that remain beside Competitor’s name on the NRS Leader Board after Event judging and verification is complete. For 5-9 Competitors one places pays, 10-19 two places, three for 20-29, etc. Big Bass Prize: From $25 (for five registrants) up to $50 (for 10 or more; see Payout Chart) will be awarded to the KBF Member who submits the highest-scoring bass of the Challenge. Ties are broken by upload time stamp, with the prize going to the one whose photo was submitted earliest in the Challenge. Mystery Bass Prize: For each Challenge with 20+ registrants, a Mystery Bass score will be randomly generated each month and, at the end of the event, the competitor with a photo on the NRS Leader Board of (or closest to) that Mystery Bass score will be awarded a $25 KBF Gift Certificate. Ties are broken by upload time stamp, with the prize going to the one whose photo was submitted earliest in the Challenge. 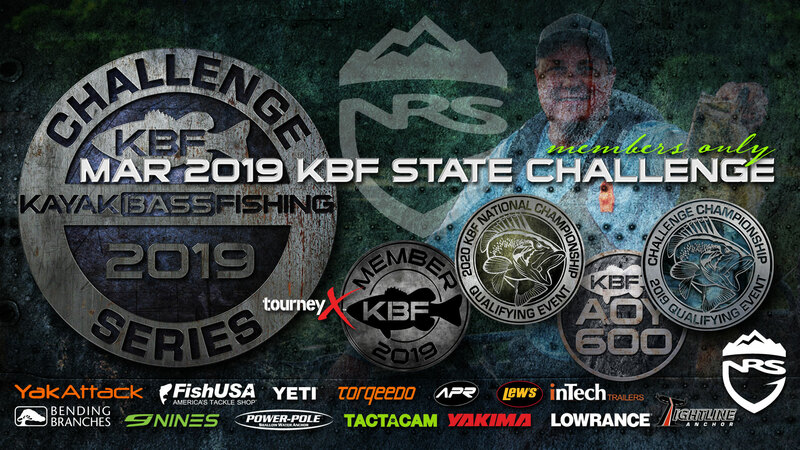 2019 KBF Challenge Points: Maximum 300, minimum 30 Registration Points, 60 Participation Points (at least one photo submitted, even if of a blank measuring board with identifier card). 2020 KBF National Championship Qualification: Awarded to top 10% of field, rounded to the nearest 10. If recipient has previously qualified, the award does not roll down. 2019 KBF Challenge Championship Qualification: Challenge winner (first place) qualifies to compete in the October 2019 KBF Challenge Championship. If previously qualified, this award does not roll down. 2020 KBF TENvitational Qualification: Challenge winner (first place) also qualifies to compete in the 2020 TENvitational tournament—an invitational event for KBF’s top-tier competitors. If previously qualified, this award does not roll down. • Tournament photos and submission details are visible on the TourneyX NRS Leader Board for public review. • A 24-hour Dispute Period commences at end-of-competition time. When all disputes submitted by Competitors have been resolved—no less than 24 hours later—prizes, Challenge Points and KBFNC and Challenge Championship qualifications are finalized and will be posted on this page with an event recap on Facebook. …or photograph or scan it, and email the digital photo to Lynette Brentlinger, KBF Customer Care Manager, at shopkbf@gmail.com. • KBF uses information from the IRS Form W-9 to prepare IRS 1099 forms, a copy of which is sent to the IRS and another to the Competitor in January for income tax return preparation. • After KBF has received the completed, signed and dated Form W-9, it will distribute cash prize and bonus payments via PayPal Funds Transfer to the email address provided by Competitor during event registration.